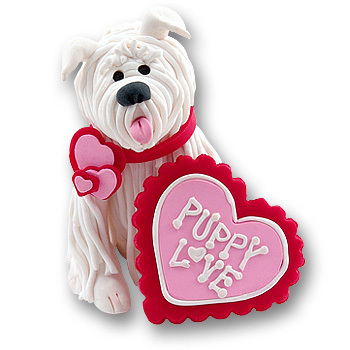 One of Deb's adorable puppies, this "Puppy Love" figurine is ready for Valentine's Day or any occasion! "Puppy Love" is a 3 dimensional free-standing figurine and can be used as a mantel or shelf decoration. He does NOT have a hook. He is the perfect gift for anyone on your list and appeals to all ages, young and young at heart. Designed by Deb and handmade from Polymer clay. It is extremely detailed on the front, back and sides. Even the words "Puppy Love" are handcrafted from polymer clay. This figurine is not designed to be personalized. ALL ORNAMENTS ON OUR WEB SITE ARE DESIGNED AND COPYRIGHTED BY DEB & CO. AS WELL AS THE PHOTOGRAPHY.